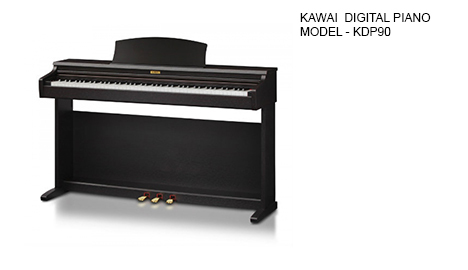 An exceptional introduction to Kawai quality. The KDP90’s Advanced Hammer Action IV-F (AHA IV-F) keyboard action has been developed to represent the distinctive touch of an acoustic grand piano. Its springless technology and sturdy construction delivers consistent upward and downward motion for a smooth, natural, and highly authentic piano playing experience. Moreover, just as acoustic pianos utilise heavier bass hammers and lighter treble hammers, the AHA IV-F keyboard action also employs different hammer weights, appropriately graded for each playing range. Such realistic details provide greater stability during fortissimo passages, while preserving delicate pianissimo control, to satisfy the demands of even the most discerning pianist. The KDP90 digital piano captures the beautiful sound of Kawai’s highly acclaimed EX concert grand piano, with all 88 keys of this exceptional instrument meticulously recorded, analysed and faithfully reproduced using proprietary Harmonic Imaging technology. This unique process accurately recreates the broad dynamic range of the original grand piano, affording pianists an outstanding level of expressiveness ranging from the softest pianissimo to the boldest fortissimo. Additional reverberation effects that simulate the acoustic environment of a recital room, live stage, or concert hall are also applied, resulting in a rich, vibrant acoustic piano tone that delivers breathtaking realism and authenticity. Complementing its authentic keyboard action and rich grand piano sound, the KDP90 offers a variety of useful digital features. For aspiring pianists, the integrated metronome, lesson songs and dual headphone jacks ensure that practise is both productive and engaging, while more advanced musicians will appreciate the alternative instrument sounds, Dual playing mode, and song recorder functions.